Amendment to constitution means an act of addition of new or deletion or alteration or changing the existing provisions/laws of the constitution by the procedure made by the law itself. 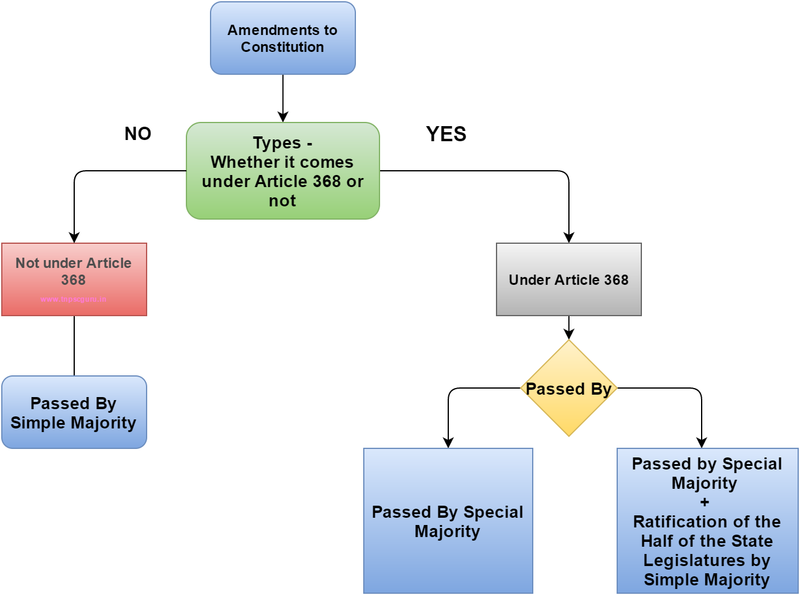 To know about the amendment process and its types, one should be very clear about what is simple Majority and Special Majority. In Simple Majority, the minimum number of members to be present is same as the Quorum which mean one-tenth of the total members of the respective house. To pass a bill with simple majority, more than 50% of the members present in the house should vote in favour of the bill. In Special Majority, the minimum number of members to be present is more than 50% of the total membership of the respective house. To pass a bill with special majority, more than two-third of the members present should vote in favour of the bill. Important Facts to remember will be added soon.